Washburn Guitars adds a new line of Resonator guitars to their Folk and Bluegrass instruments. Washburn recognizes the important role played by the Resonator guitar in the history of bluegrass music and has decided to honor the instrument with a new line of Resonator guitars. The current line up of Resonator guitars include the acoustic resonators R15R and R15S, and their acoustic electric brothers the R15RCE and the R45RCE. Washburn Guitars has announced a new Vintage Jazz Box archtop hollowbody, the J600, and two new additions to its range of Parlor acoustics, the R315KK and R321SWRK. These guitars were on display at the NAMM show in January, alongside Stu Hamm’s new signature Washburn bass, The Hammer. The Jazz Series addition features a maple neck with rosewood fingerboard, spruce top, flame maple back and sides, gold hardware, bound f-holes and a Venetian cutaway. RRP is $1247.90, available mid-2011. The Parlors are based on the R314K and R320SWR vintage models, minus the ‘vintage’ finish. Both feature mahogany necks with ebony fretboards and bridges, abalone rosettes and herringbone bindings. The R315KK has a spruce top while the R321SWRK boasts a solid spruce top and solid Rosewood back and sides. Washburn Guitars, pioneering the world’s finest cutting-edge instruments for over 12 decades, has announced today of the release of a stylish yet affordable HM Import Guitar Series. The HM-Series is designed for superior tone and quality, the Import Series features a revolutionary Phenolic fretboard, providing the ultimate surface for fast riffs, arpeggios and runs. Phenolic is a resin that has a very smooth glass like feel similar to ebony. Notably, some pool balls are made from Phenolic Resin. All Washburn HM Import Series Guitars feature a solid mahogany body and neck, Grover Exclusive tuners. The series also includes Randall pickups, which have been specifically designed to match the tone woods of these guitars, providing the ultimate guitar to amplifier tone. The HM Series is currently available at Washburn retailers. 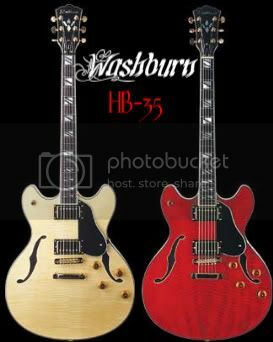 Washburn puts just enough spin on the HB-35 to make it both a strong contender for the Gibson ES-335 customer and a viable alternative to the ES-335 clonedom. The body’s cutaways are a shade wider and less like the “mouse ears” of standard ES-335s, and the extra handroom really does provide greater access to the upper frets. The body is covered front, sides and back with the deliciously tight-flamed sycamore (a close relative of maple) in a pale golden yellow natural finish (tobacco sunburst and whine red finishes are also available). The rosewood fingerboard, ornamented with variations on split block inlays, has an open grain which is sealed, leaving a surface that’s attractive and silky smooth. The gold hardware (including Grover Tuners and a Tune-O-Matic bridge) is an appropriately regal touch, making the Washburn the most handsomely appointed guitar of the batch. The attention to detail extends to the workmanship and playability, too. The neck is a solid-maple affair, with a wide, mildly V-shaped contour. A scarf joint at the headstick is added for strength. The frets are medium-tall and somewhat triangular, and the sides of the fingerboard are slightly rounded for a friendly “played-in” feel. The setup, with .011-.049 strings, including a wound G, was perhaps the best of all the guitars straight out of the case from our hollowbody review models. The action was boldly low, yet free of buzzes, and the heavier strings and triangular frets contributed to a firm and precise feel. Clean amp settings unveiled a somewhat dark neck pickup and a refreshingly open bridge pickup that country players will love. The pickups work well as a pair, but I suspect a pickup swap would add some fresh air to the neck position. On the other hand, the pickup combination made perfect sense when sent through overdriven amp settings. The pickup growled on command, and the neck pickup had a smoky jazz tone that cleaned up well. The combo position retained its identity even as high-volume leads sent the responsive tope into resonant feedback. Looks great, feels great, sounds great. You could cover a lot of gigs on this axe. If it sold for close to two grand, I’d call it a great guitar. At a list price of $949, it’s a bargain to boot. Gear-Vault Classifieds is an eBay alternative. Come sell your music equipment with us.